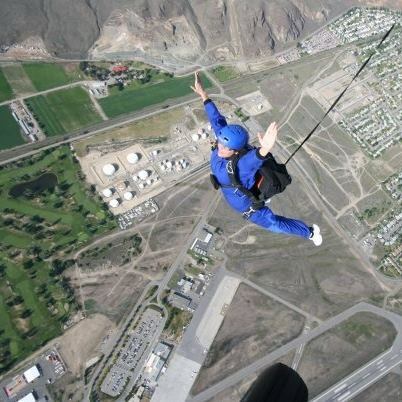 First Jump Course – Skydive Kamloops! Maymeet 2017 – The 50th! That SIMPLE, that EASY, and memories for a LIFETIME!!! Over and over again the Instructor Assisted Deployment method has proven to be the safest for dispatching first time jumpers. Even in the old days, with the round main parachutes, they couldn’t touch of safety record. We have developed through refinement specific training methods and equipment that doesn’t let us down, nor will they let you down! The whole experience is a TONNE of fun. Your instructors will assist you in every aspect of your skydive. The Jump Master will tell you when, where, and how to get out of the aircraft safely. He/she will then help you to deploy your main parachute safely after leaving the aircraft. The Ground Control Instructor will direct you to the landing area and provide you will the necessary instructions to have you land softly back on the solid earth. You will be aware of everything that is happening. We want you to experience the satisfaction of having performed most of the skydive on your own. On top of it all we’ll try our best to have you smiling and laughing all the way! So grab some friend and family, sign up, and get ready for one heck of a good time! *NOTE: Due to safety restrictions there is a maximum weight of 220lbs for first jump students.